McCARTHYISM, n. 1. The hurling of baseless, slanderous charges at political opponents, be they groups or individuals; 2. A common means of leveling such charges through the deliberate conflation of two unrelated things, such as anti-Semitism and criticism of the state of Israel, or racism and criticism of Islam or Muslims (who come in all colors). Most Islamic believers are black or brown. So, criticism of Islam (a religion) is an attack on black and brown people. Therefore those who criticize Islam are racist. Most Israeli citizens are Jewish. So, criticism of Israel (a political entity) is an attack on Jewish people. Therefore those who criticize Israel are anti-Semitic.. Most American child molesters are white. So, criticism of child molesters is an attack on white people. Therefore those who criticize child molesters are racists. And there you have it. What passes for political discussion in the land of the free. How Germany is Using ‘Anti-Semitism’ to Shut Down Israel Criticism | Interview with Max Blumenthal ! With ISIS running amok in Iraq and Syria, committing mass murder in brutal, horrific fashion, it’s relevant to review probably the most direct sci-fi treatment of what a Muslim fundamentalist takeover would mean: Tom Kratman’s Caliphate. It’s in the form of a standard military/adventure sci-fi novel set a century in the future. But more than that it’s a political novel, concerned with a Muslim fundamentalist subjugation of Europe. Until recently, I’d have thought Kratman’s descriptions of the horrors inflicted by Islamic fanatics basically accurate but overdrawn. No more. Look no further than ISIS, Al Qaeda, Boko Haram, and Al Shabab, and the barbarities committed on a daily basis by the Saudi and Iranian regimes. One other praiseworthy aspect of Caliphate is that Kratman illustrates his description of the horrors of Islam with quotations from Muslim writers, whose own words condemn them. To his credit, though, Kratman is not entirely uncritical of the U.S. His description of the public reaction to further Muslim terror attacks and the subsequent fascist takeover of the U.S. is all too believable, as are his descriptions of atrocities committed by both Muslim and U.S. soldiers in the war he vividly describes. But strangely, given the overtly religious, theofascist nature of virtually the entire American extreme right, the American fascist government he outlines seems largely or entirely secular, though it’s hard to tell because of the sketchiness of the description; Kratman almost entirely ignores America’s Taliban–the authoritarian fundamentalists, conservative Catholics, and Mormons who want to turn the U.S. into a theocracy, the Christian equivalent of Iran. He seems to blithely assume that secularism will endure, even following a fascist takeover. It’s also unfortunate that in the Afterword he equates the in-part unassimilable, authoritarian, misogynistic Muslims in Europe with Mexican and other Latino immigrants in the U.S. This is a terrible, inappropriate comparison. For over 20 years, I’ve lived in a neighborhood that’s roughly two-thirds Mexican, with a great many people here being first-generation immigrants. They’re not trying to impose a religious ideology on anyone. They’re not trying to set up religious courts. They’re not murdering people for religious reasons. They’re assimilating as quickly as they can. Overall, they’re hard working and do the dirtiest, most dangerous jobs simply to support their families. To equate them with authoritarian religious fanatics is highly offensive. 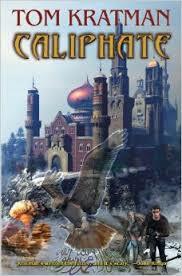 Still, despite its faults, Caliphate is worth reading.